Wildcat by Kosen - 33cm. The wildcat (Felis silvestris) is a small cat found throughout most of Africa, Europe, and southwest and central Asia into India, China, and Mongolia. Kosens interpretation of this fascinating feline is absolutely stunning! He is made from several different types of the finest plush with green pupil eyes and delicate airbrushing detail. He really is a work of art! Size: 33cm / 13 inches. Kösens creations are all based on intensive studies of the anatomy and movement of real animals. Their designers draw the animals either in their natural habitat when possible or in zoos and then create them in three-dimensional clay models. Each animal is then carefully made from up to 70 individual pieces of the highest quality materials available. As well as making the most realistic animals in the world, Kosen ensure that they not only appeal to adult collectors, but that they are entirely safe to be played with too. All of the beautiful Kosen animals are made by hand in Germany. Thank you very much for looking! Established in 1992 we are an official Kosen stockist, so you can adopt your bears and friends with confidence from The Bear Garden! 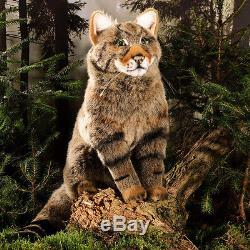 The item "Wildcat exquisite & collectable soft toy by Kosen / Kösen 33cm 6560" is in sale since Saturday, July 12, 2014. This item is in the category "Toys & Games\Soft Toys & Stuffed Animals\Branded Soft Toys". The seller is "thebeargardenuk" and is located in Guildford, Surrey. This item can be shipped worldwide.